Droves of people have turned to local food as a way to retreat from our broken industrial food system. From rural outposts to city streets, they are sowing, growing, selling, and eating food produced close to home--and they are crying out for agricultural reform. All this has made "local food" into everything from a movement buzzword to the newest darling of food trendsters. Changing our foodscapes raises a host of questions. How far away is local? 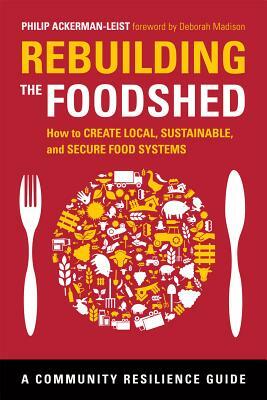 How do you decide the size and geography of a regional foodshed? How do you tackle tough issues that plague food systems large and small--issues like inefficient transportation, high energy demands, and rampant food waste? How do you grow what you need with minimum environmental impact? And how do you create a foodshed that's resilient enough if fuel grows scarce, weather gets more severe, and traditional supply chains are hampered? Philip Ackerman-Leist, author of Rebuilding the Foodshed and Up Tunket Road, is a professor at Green Mountain College, where he established the college's farm and sustainable agriculture curriculum and is director of the Green Mountain College Farm & Food Project. He also founded and directs the college's Masters in Sustainable Food Systems (MSFS), the nation's first online graduate program in food systems, featuring applied comparative research of students' home bioregions. He and his wife, Erin, farmed in the South Tirol region of the Alps and North Carolina before beginning their sixteen-year homesteading and farming venture in Pawlet, Vermont. With more than two decades of "field experience" working on farms, in the classroom, and with regional food systems collaborators, Philip's work is focused on examining and reshaping local and regional food systems from the ground up.